What is it? A pen made from Italian acrylic in Taiwan, with a German nib, and assembled in the USA. Wowzers, that was a hard supply chain to follow! This is a pen that I’ve never heard of. Honestly, I had never heard of IPenStore before either (they’ve been in the stationery game for 75 years, spread across 4 generations!). When they got in touch and offered to send over a fountain pen to check out, I was intrigued. Their product page has some photos that don’t totally represent the pen you get. What looked a little drab ended up being a vibrant, deep, richly colored acrylic with nice shine. Their pen feels really quality and has some nice accents that help it punch well above its $69 asking price. Interested in picking one up for yourself? Check out IPenStore.com for more great deals on fountain pens and other stationery accessories. 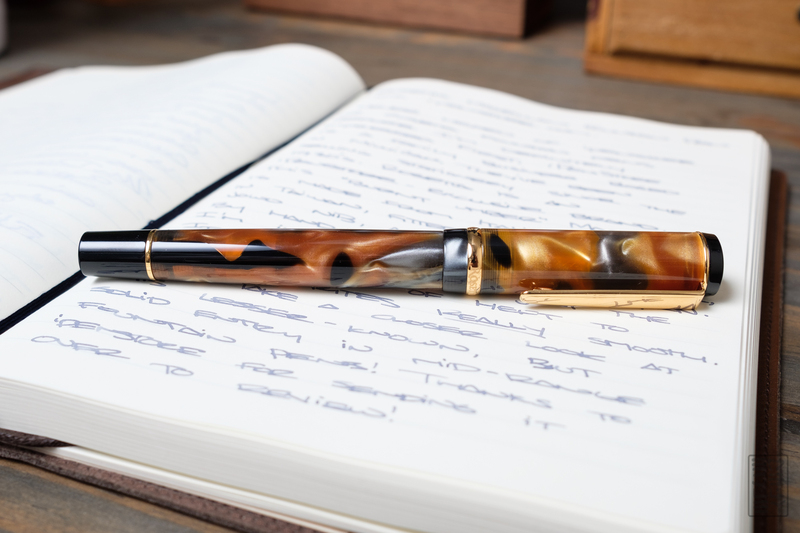 This pen is kind of a stunner…The product photos may lead you to believe otherwise, but the acrylic has so much depth, shimmer, and transparency to it. It’s really interesting to look at, even more so when the light hits it in different ways. I put together a quick video to show off the depth of the acrylic and how it changed based on the light. The gold accents complement the rich brown color really nicely. I also really like the compass rose cap finial. It looks classy without being too over the top.I don’t love the way the Jowo nib looks with the laser engraving, but the writing experience makes up for it. The Rosetta Magellan comes in a pretty standard leatherette gift box. The Magellan has a steel nib on it. The medium nib I have writes well right out of the box. It’s exceptionally smooth with medium flow. I’ve been using it with Iroshizuku Fuyu-Syogun, as it matches the great striations in the acrylic. The two-toned steel nib looks pretty decent with the stamped filigree, but the engraved “Rosetta” name leaves something to be desired. I get why they add that extra bit of branding, but I don’t think it’s necessary. It does detract a little bit from an otherwise great looking pen. Again, I was pleasantly surprised by the hefty, quality feel of the pen. Most of that heft is in the cap. This is okay when carrying it, but it does get a little back heavy if you post the pen while writing. The size of the pen is what I’d consider a little larger than average, but not in any way uncomfortable. Posting the cap may be a bit too much for most people, but it’s not necessary for a pleasant writing experience. The section is short with a tapered flare and does put your grip a little close to the threads. There’s no significant step down, so writing is still comfortable. In the long haul, I think most will find the pen comfortable to hold, carry, and write with. I’m pleasantly surprised by the overall quality of the Rosetta Magellan. It’s a brand that I’ve never heard of, and frankly when I saw it online, I wasn’t super excited to check it out. This is definitely a case of being completely surprised by something. It looks classy, writes great, and feels great too. Overall, I would recommend checking these pens out — especially given their reasonable asking price of just under seventy dollars. Thanks again to iPenstore.com for sending one over for review, it might just be the sleeper hit of my pen collection! Snag one for yourself from ipenstore.com here! Pendleton Brown offers nib-meister-ed Rosetta fountain pens, and that has always impressed me. If he likes the pens enough to use them as a foundation for some of his work, then that says something. I just purchased the 1.1mm stub in the burnt umber finish. I have a Rosetta Magellan Fountain Pen, Pearl & Blue, Chrome Trim, Broad nib and it has turned out to be one of my absolute favourite pens to write with. Thank you for the amazing pictures of the Burnt Umber. Their photos really don’t do their pens justice. The pen definitely surprised me! You’re very welcome, it’s a really nice material. There’s some transparency to the amber colored parts too that I was unable to capture. I understand. The Pearl White pen is so much more vibrant in person than in photos. And honestly, your photos are far superior to ipenstore’s. I think they’d probably benefit a lot from re-shooting most of the Magellan’s. If you like pocket notebooks I would recommend the Rosetta notebooks as well. The broad nib is really wet, and even using Private Reserve Ebony Blue, there’s no bleeding and very little ghosting. a stunning looking acrylic for a fountain pen. very nice. It looks a decent pen for the price. It does bear a similarity to the Conklin Duragraph in amber. My wife bought me this exact pen at the Ohio Pen Show four or five years ago. It’s beautiful. It is hard for pictures to capture the depth of the acrylic. Rosetta offers “quick change” sets in different nib sizes that are the nib, feed, section and converter together. One of my favorites, carry it every day in a Rosetta two-pen leather carry case. Not sure if they still make the cases any more.